In early times, the parish of Downton formed part of a great estate granted to Winchester cathedral. The village itself was divided topographically into three sections which were linked by bridges. Settlement had developed in the High Street, so called in 1452 in a document in Winchester College archives, and from the mid-15th century the area was called the east borough. 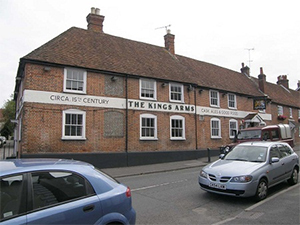 The King’s Arms, at the junction of Church Hatch and High Street, a solid-looking brick building with a tiled roof, was known to be a public house in 1628. We know who owned and occupied the King’s Arms in the mid-C18 from the Guildhall Library insurance documents. These refer to James Russell, a schoolmaster of Downton, who took out a policy in 1755 ‘on his house only being the King’s Arms Inn at Downton …in the tenure of Lucy Loveday, Innholder… Brick, Timber and Thatched, Brewhouse only adjoining, Thatched. Two Stables only belonging, Thatched, £10 each.’ He paid £250 on the inn and £30 on the brewhouse. This historic pub has now closed after at least 350 years of serving customers, and probably a good few years before that. The Royal Commission on Historic Monuments (England) investigated it in 1980 and found the substantial remains of no less than three medieval timber-framed ranges inside, hidden by the mid-C18 facelift. This is the type of detail that makes the building archaeologist’s job so absorbing – separating successive layers of alteration which can be driven by fashion, fortune and function. The King’s Arms proximity to St Laurence’s church, a particularly large and splendid church which accommodated congregations from as far afield as Redlynch, Morgan’s Vale and Charlton, must have been advantageous to the King’s Arms, set right at the entrance to Church Hatch. The church dates from 1150 and represents flourishing trade from early on, which had increased by the 15th century; the date of the King’s Arms. The town used to send not one, but two members to parliament. It is likely therefore, that such a large and commodious inn would be used as a regular meeting spot not only for recreation, but business. The Salisbury Journal periodically advertised auctions held at the King’s Arms, for the sale of an estate, houses, brick kilns and timber; also a meeting of the Association for the Protection of Property on April 8th 1811 and mention of a ‘stray ox left at the King’s Arms’ on Sept. 10th 1804 – not a common occurrence today! 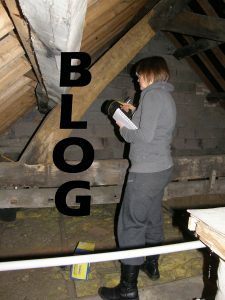 The Wiltshire Buildings Record’s annual study day in October 2017 was on the subject of inns, taverns and alehouses, and this year on October 20th 2018 we will be looking at timber-framed houses. Details available soon. If you would like to be added to the mailing list, please contact me at the History Centre.